I love showing how much those two love each other. And what poor li’l Robespierre gets into. Plus, it was a chance to show off Larry’s amazing collection of ties. Man, what a variety, huh? And the grape reference? 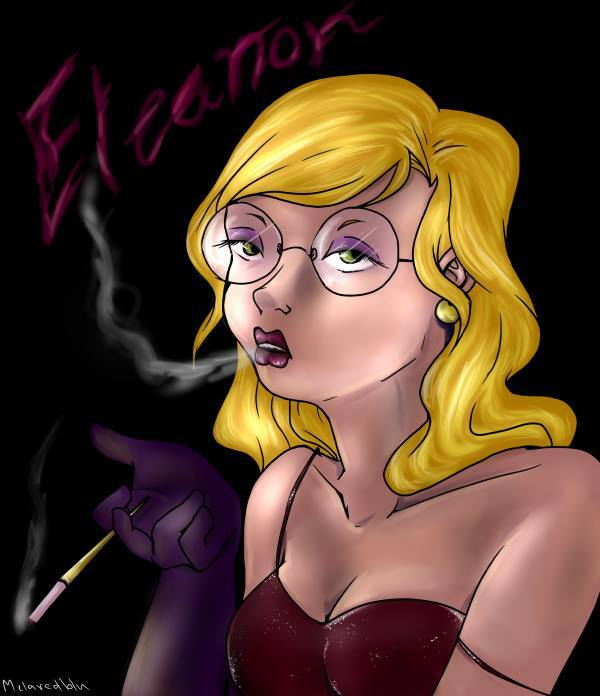 That goes with a big thank you to melaredblu, who decided that Eleanor’s lipstick colour would be purple. It makes perfect sense, and she’s proven it! What a Lovely simple and sweet set. Glad you liked it, Mike. Sometimes it’s just nice to show two more or less sane people enjoying one another’s company and being happy. Ooo what could this historical webcomic event be?! I will be waiting on the edge of my seat to find out. 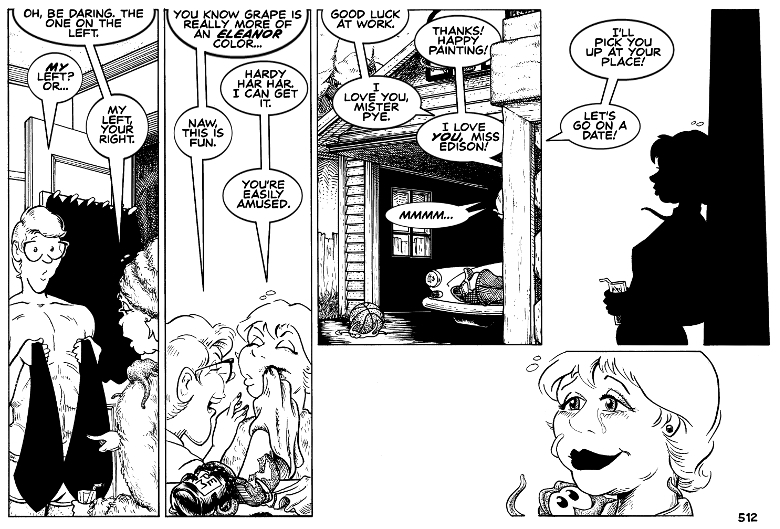 This was just a lovely strip, really showing how those quiet, everyday moments can mean so much and be filled with happiness. You’ve really illustrated it quite well here. I totally agree with melaredblu–grape is totally an Eleanor color! And her awesome fanart proves it! That’s exactly what I was going for, mj. With all the craziness happening in GK land, I wanted to show two people (and their mischievous hexapod) just being a couple in love. And I think you’ll really appreciate what’s coming up. melaredblu is a genius. If I ever do GK in color, I’m going to go to mel for color swatches. Is Larry like a certain mouthless doodle-comic character, and has only white shirts and black ties in his wardrobe? It just makes her lips that much more kissable! And there are some similarities, aren’t there? Well, when he’s not at work he’s a real Beau Brummel, as we’ve seen in the past. That man can do plaid better than most. “My left? Or…” This really resonates. Funny thing is, he probably knows which tie she’s pointing too. He’s just not sure that it’s an appropriate one for work. Yes. And she likes taking care of him. Hmm… Which one to pick. The jet black one, or the jetter black one. They really are the cutest couple some times, aren’t they. For all they flaws that they bring out of eachother, they’re still the perfect match. Just so wonderfully… human. That’s exactly what I was going for. Flawed, but happy together. Though Robie will avoid basketballs in the future, we hope. Larry and Edison have that rare kind of love. The tragic kind, unfortunately, if Edison keeps on drinking, like she is capable of, she will not wake up one day. Larry will be devastated. Edison has two loves: Liquor and Larry, she will have to pick one. Perhaps she’s aware of that. She might be crying for more than just happiness.